Print Room is a comprehensive Copy Center management application which allows Copy Center managers to easily track, manage and bill all jobs. 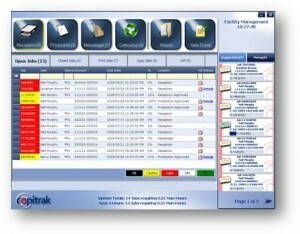 Copitrak Print Room links with the Job Submission module to allow users to automatically flow jobs to the Copy Center. An accurate job ticket will save Copy Center personnel from unproductive follow-up on missed details. The shop manager can now easily monitor and control jobs submitted by users. The system also allows the shop manager to “drag n drop” jobs to a selected device from the Print Room Application. 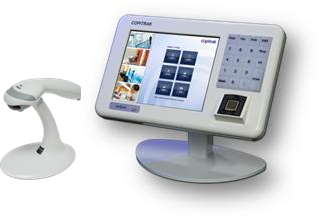 Users can query the Copitrak System Software (CSS) server for real-time status of their jobs progress. Of course, all jobs will be accurately priced and transactions available for immediate transfer to the firm’s Financial Software. Allows users to easily submit Jobs in an automated fashion to the Copy Center. Frees Copy Center Personnel from unproductive follow-up on missed details. Both electronic and hard copy Jobs can be submitted. System can be set to automatically force routing of jobs to the Copy Center. Allows the shop manager to easily monitor and control jobs submitted by users. Manager is notified immediately when a job enters the system. Manager can submit jobs by simply dragging the Job on the Print Room application screen to the appropriate Device. Users can check the status of their jobs via the Copitrak Desktop. Advanced Crystal Reporting allows for an infinite number of reports including, job specific report, and Copier/Printer utilization reports, Production Staff productivity reports, and many more. Multi-tier pricing allows reports to reflect both cost to client (including mark-ups) and cost to the Production Center. Invoice style reports which can be submitted along with client billing.